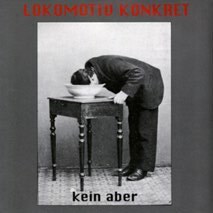 Lokomotiv Konkret has existed since 1975 and is the catalyst of new wave of Swedish free improvised music. Kein Aber was recorded live in Stockholm in 1994. The line up of the group is Dror Feiler on reeds, Soren Runolf on electric guitar and cello, and Tommy Bjork on drums and percussion.